Hot this week: Destruction at the Mosul museum. In an unregulated art market with endless disputes and many avenues for crime, we are seeing the rise of the art lawyer. Reflections on believable and unbelievable news. Among other things, Egypt’s new terrorism law states that any entity that endangers antiquities should be labeled a “terrorist group”. An audio programme about the 1897 theft of the Benin Bronzes by British soldiers. A text article to go along with the audio story. The San Pedro House of Culture was burgled and a number of Maya antiquities were stolen. Interpol has been contacted in an effort to recover the tiems. You all know Andean Church Theft is my pet topic. The collectors bought the pieces, stolen from a church in 2002, from Brazil which tells me a lot about the path these items take. The paintings were checked against the Interpol database before an exhibition and were found to be stolen. Much the same article but with a photo of the collectors who returned the paintings. On reclaiming Inuit remains held in foreign museums. Cuba rejects that art seized from exiles was stolen and claims that it has no mechanism to return it. 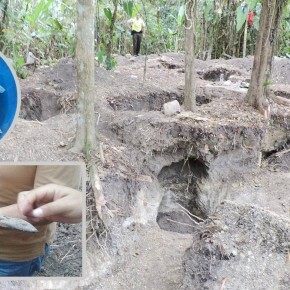 Manta culture cemetary found to be totally looted. Looters appeared to work there for around 20 days. Police are now guarding the site. Guatemala has determined that the a gang that stole, among other items, the beautiful Colonial paintings in El Calvario Church in Antigua were most likely working ‘to order’, they had a buyer lined up. This report says that people working on construction projects in Quintana Roo are finding artefacts and not reporting them. They spoke with people who worked on an airport near Tulum who said they just took stuff home. The images shared in the article appear to be of fakes. This was announced at an exhibition of other repatriated items. Apparently this is the result of a decades-long court battle. This is after the long process of having the artworks restituted. Meth and drug distribution items were also found in the home. This is the result of a 7 month investigation into artefact theft and trafficking in the region. Also some Pompeii frescoes, a cannon, ancient Greek pottery. Appears to be results of several cases but no details given. La Coiffeuse (1911) had been missing from the Centre Georges Pompidou since 2001 and was found in a FedEx shipment from Belgium declared as “art craft/toy” with “Joyeux Noel” written on it. We all have a favourite. Christie’s cancelled some sales due to buyer complaint, including that of a necklace for $8.8 mil because it was billed as ‘The Taj Mahal’ but not actually owned by a Mughal emperor. In trying to not alienate the buyer, they appear to have angered the seller and it is now messy. He could be totally lying but the museum has to take it seriously. As attempts to reach an amicable settlement have failed, the court will rule on what is to happen to 85 Cypriot antiquities stolen by Turkish antiquities smuggler Aydin Dikman. The claimants say that the medieval Christian Guelph treasure was taken from their relatives under duress in 1935. The museum that houses the treasure say the sale was consensual and a fair price was paid. The exhibits were stolen several years ago and were found in an apartment during a search associated with an unrelated case. The metal detectorist who was found to have looted and not reported a ‘barbarian’ treasure was given a suspended sentence of 1 year, 3 months and a 3000 euro fine. The painting was stolen from a home in Turin in 1982 and was discovered when it was put up for auction last year. The statue was stolen from the Oliveriano Archaeological Museum 51 years ago and was also found when it was put up for sale at auction. Fragments of sarcophagi stolen in 2003 from the Roman Catacombs of San Callisto were found being used as decorative elements on a farm in Norcia, Umbria. Some words on the previously mentioned cases. Interestingly this is another case where the buyer was given a promise not to prosecute if they returned the statue. In the exhibition “The Stedelijk Museum in the Second World War” the museum displays 16 paintings by artists including Paul Klee, Wassily Kandinsky and Henri Matisse that they admit they may not rightly own. Art Historian Elena Basner is accused of selling a fake of In the Restaurant, a 1913 work by Boris Grigoriev. The original State Russian Museum and the man she sold it to says it was a plot. The tapestry of the Virgin and Saint Vincent, a 16th century piece, was stolen by the famous art thief from the Cathedral of Roda de Isábena in 1979. It was located in the United States in the hands of a collector and returned to Spain in 2013. The suspects were arrested in Valencia and include counterfeiters and intermediaries. 271 works were also seized. According to the Kunstmuseum Bern the heirs have not provided the proper paperwork but representatives from Art Recovery say this is not true. The charges are for defrauding customers, possibly to do with manipulation of art market prices. This article is the epitome of reckless. It reports that ANOTHER PAPER reports that ISIS-looted Syrian items are being sold in the UK. The experts quoted aren’t saying that. The 25 wooden blocks made up an original Victorian road surface in the North Entrance tunnel, Western Heights. The article claims that over the last 4 years nearly 800 artefacts from these countries have been imported into Australia, although I caution that many of these will be under entirely legal circumstances. The Protection of Cultural Objects on Loan Scheme would ‘protect’ cultural objects on loan from foreign institutions from being subject to legal claims. This, of course, means that they can borrow looted antiquities and objects without countries of origin or individuals being able to do anything in the new jurisdiction. According to the priest, three bronze statues were stolen from a temple in Laharpur. The police have been notified. Nine idols were stolen from the Digambar Jain temple in Meerut on Wednesday along with a donation box. The four individuals sentenced were convicted of stealing 7 bronze idols from the Irudhayapureeswarar temple at Thilaisthanam in Thanjavur district in 2010. Google translate is not the best with Gugarati so I can’t quite read what went on here. The theft of the hand-written Torah from a synagog in Shiraz was reported two weeks ago and the FARS news agency is saying the manuscript has been recovered and returned. “The West is the Best” is an argument for fools. The author neglects to mention that history is mostly random. Had the BM been bombed during WW2 (or whenever) we’d lose those winged bulls. Yes, and there is a disturbing amount of misreporting. Apparently the reopening was brought forward in response to the destruction at the Mosul Museum. Interestingly he sort of says that artefacts may have been stolen from the museum and warns that they are documented and can be tracked. There is a lot of looting in Israel and archaeologists fear that news like the gold hoard found and properly reported by divers will inspire more looting. In what seems to be a response to Turkey’s relocation of the Suleyman Shah tomb, Syrian culture minister Issam Khalil says, basically, that antiquities trafficking is Turkey’s fault because they are not securing their side of the border. Much like the previous article on the topic. Much Turkey blaming for the illicit trafficking of antiquities. We are at a point where the NYT is reporting what academics are saying on Twitter. Careful what you say. The tension between commercial fossil sales and science.